The latest dream solution for acne treatment is said to be the Vitamin B5 acne treatment . It is believed that taking high doses of Vitamin B5 will help you not only cure your existing acne but also control the outbreak of more. It'll also give you clear and blemish free skin. Does B5 Help in Acne? But does it really do what it says it does? Let's know all about it in detail. It all started with the paper Dr. Lit-Hung-Leung published. It this paper he propagated the theory that acne is caused by Vitamin B5 deficiency. The main purpose of the Vitamin B5 is to regulate hormones and process lipids or fats. When the vitamin B5 gets depleted in the body then as per priority basis the body starts using the available vitamin B5 only for the neural and hormonal activities. And whatever if left is allowed to use for processing the fat. Hence there are times when the fat starts accumulating and then the excess fat is processed out of the body in the form of sebum through the sebum glands on to the skin. Hence, you get an oily skin. Dr. Lit-Hung-Leung may not have been correct about an over dose of vitamin B5 curing acne. He wrongfully assumed that acne is caused when there is a deficiency in vitamin B5. In such a case, the body begins to use the existing vitamin B5 for the making of the androgen hormone and the production of fatty acid metabolism takes a back seat. The problem is, vitamin B5 deficiency does not cause acne because of the simple fact that not everyone with a B5 problem has them. There are many B vitamins and they are all interrelated. And so, if you are taking a large dose of one such vitamin, it would have no therapeutic effect - in fact, it may lead to a deficiency of others. Yes the vitamin B5 and the other B vitamins are needed to maintain a clear skin, but you must remember not to take them in high doses. The skin at any normal time naturally has many blocked pores but there's hardly an excess of oil in them. But when in situations there's excess sebum being produced, this sebum starts flooding up these blocked pores. This creates a visible "bump" on the skin and also creates an environment that encourages bacteria and the skin around the "bump" gets infected. This is the cause of acne . The fact is you have to take real high doses of vitamin B5, in fact monstrously high doses. Vitamin B5 is supposed to be water soluble and it is believed that an excess of the vitamin B5 is flushed out through urine. Is Vitamin B5 Treatment Really Successful? 6. Cracks in the corners of the mouth that do not heal very quickly or properly. It depends on you whether you are ready to undergo these kinds of side effects to try the vitamin B5 acne treatment which still hasn't been proved successful completely. 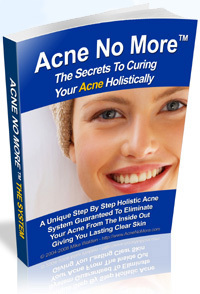 The best way to deal with acne treatment is the holistic approach. Just by taking huge doses of one particular vitamin can't help you treat this problem. To achieve a clear beautiful skin you need to achieve the right balance of healthy body, mind set, detoxification of the toxics and the hormonal balance. Everything has to be taken care of, and you only achieve this through the holistic approach. It is devoid of any kind of side effects. And when you decide to opt for the holistic approach you'll not only be able to solve your acne problems but feel healthier over all.